It was the crew members that had to be kept as they were, and that took a long time to discover. those specific individuals, and can´t live without them! the Lewis gun, all the glue, and optimizing different elements as they get their turn, is going fine. there´s only a few glue templates left to be put on the wheels, and it´s done, but I´ll do it tomorrow. Parts count is at 147.1%, and SCASM isn´t protesting, and I´m glad I didn´t give up at the end. So, after all, we will fortunately be getting the Caudron G.4 bombers! After I finish this one, I´ll do the one with the radial engines. is the 2 virtual cockpit gunner-views for TG2, to be implemented via SCASM. SCASM seems be accepting the build so far, with 148.1% parts, which is a great relief. animated, but I´m not going to push my luck, and it will stay put. all in all, it´s turning out great. Here are 2 shots, while I do the SCASM VC´s for the upload. SCASMing for the two virtual chase mode views worked fine. It was also possible to include a correct display of all the struts as seen from the pilot´s and the gunner´s position. I´m just finishing the texts and the DP files for the upload. This one looks really cool. Only bad point I can find is the propellers are too wide. It looks like the front-facing MG will be cut if the gunner turns it just a little bit! but I think the gun swivelling point is so far forward that the barrel doesn´t interfere with the props. Drawings show very close propellers - sources quote very good single engined control as a result. Anyway, here are a drawing, a screenshot and the AF99 blueprint. and the blueprint shows just about the same. I believe I know what´s wrong: The simplified swivel supporting point on the model is placed too far back. Anyway, I´m glad you like the model! You are much probably right about the propellers. I might be used to see replicas which often use smaller propellers. As you can see the gun swivelling point is right above the front end of the nose. I was just altering the necessary parts to get the swivel point further forwards, but the glue sequence with the windscreen and windscreen-frame fails. I was just checking some more photos - lots of them show this way of mounting the gun, including Numbers 7 and 9 of Escadrille 47, so I´ll do it that way. Good that you mentioned it! Here´s another picture, showing a two-gun version. The front mount is similar to the one on your photo, although it seems to be able to come out of the nose to rotate upwards, and also, there´s no windscreen. front windshield has also been removed, as per photos of the model being worked on. Re-SCASMing the 2 Virtual Cockpit views also went well. make the screenshot look more interesting. grouped differently, at the cost of some unavoidable but minor bleeds with the taiplane. Anyway, we´re slowly getting there! I have been a bit busy with some other things, and have been delayed a bit with the Caudron. The tail bleeding through the central nacelle is fixed, but I couldn´t put back the wires between the fins without causing bleed problems, so they´ll have to stay out. At least there is MUCH less display interaction now, which is very satisfactory. I´ve also been able to more finely adjust some vertices, not only on the tail, so that´s also coming out very nicely! Then, unfortunately I´ll have to discard the propeller blurs. Despite having an identical radius to the propeller blades, they simply won´t fit the animated AA propeller disc correctly. This disc only works with 1 decimal place in AA, and re-adjusts the size of the phantom-blades, so I´ll have to leave the blurs out, because making the propeller blades smaller is a bit too inaccurate for me. Anyway, hopefully I´ll get round to re-SCASMing the model today, and proceed with the upload! Caudron G.4 with rotary engines. I´ve just uploaded the Rotary-engined Caudron G.4 bomber/observer. Thank you very much to all who participated with comments, sympathy and encouraging suggestions! I hope you enjoy the machine. It is designed to be flown with the program add-on TG2, to fire at the enemy by pointing and clicking the mouse in the Chase-mode target box and firing the guns. There are two virtual cockpit views available, one for the nose-gunner and one for the pilot. 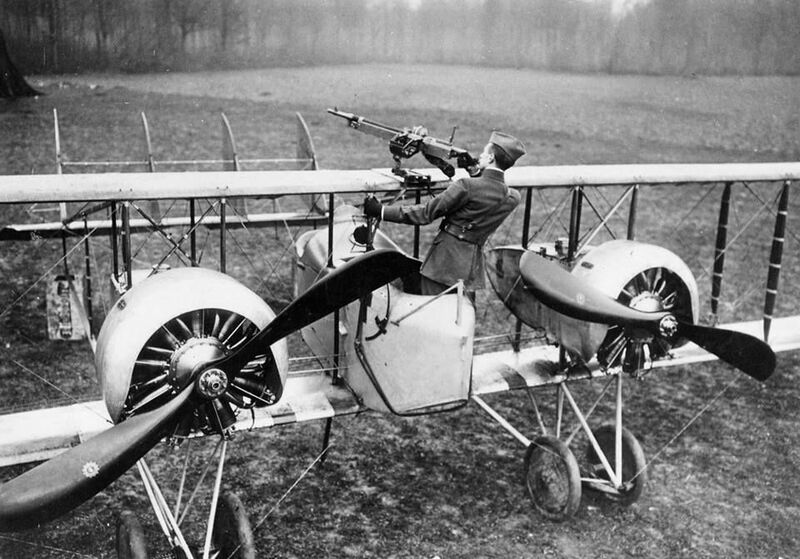 Apart from the forward-firing Lewis machine-gun, Pilot and Nose-gunner can fire rearwards using their automatic Parabellum or Luger pistols. Anyway, I hope you enjoy the model. The next one to follow, if I have enough parts (about 120? ), will be the same model with two un-cowled 10-cylinder radial engine components fitted onto the engine nacelles. They are more powerful Anzani-10´s with a max. power of 110 Hp. The 2 x 18 extra horsepower, make the plane about 3.5 mph faster, but the main advantage was that it had progressive throttle, and did not have to be "blipped" for descent, approach and landing. Wow, thanks for the demand - that of course translates into moral support! 12 downloads in under 16 hours is great! Let me know if anything improvable has to be improved. Anzani 10-cyl. radial step 1. The Anzani-10 radials have 2 rows of 5 cylinders, offset by 1/2 cylinder width, and are very part hungry. parts, so I still have a few parts left to make the exhaust. would still have the same order - but with a different blue, maybe? I wonder if anyone knows anything more accurate to this respect? shaped more correctly. They have metal-sheet heat-protection around the front behind the engines. Then, my doubts on the RNAS roundel colours have dissipated, and here´s a couple of screenshots. Also, propellers on this aircraft were handed, rotating in opposited directions. filled with white on wings and fuselage sides. As the Caudron G.4 had a lattice-fuselage, lateral roundels were placed on the engine nacelle sides. This can be seen on pictures of a Caudron G.4 from No 5 Wing RNAS, Coudekerque, France in the spring of 1916.
single-engined RNAS Caudron G.III Scouts, with these roundels on wings and also on the sides of their central nacelle. roundels, which would also have been present on the engine-nacelle sides, so I have opted for this solution. as well as changing the nose-art, but I´m slowly getting there! Well, the British Anzani radial engines are done. A bit parts hungry, but they look reasonably fine. but I think I´ll stop before something breaks. Now for the SCASMing of the 2 Virtual cockpit views, and then we´re done!! Caudron G.4 with Anzani engines uploaded. I´ve just uploaded the British Caudron G.4 with Anzani radial engines. It will be available as soon as it is approved by the SOH library. I hope you enjoy the aircraft. It has slightly more power and nerve than the Le Rhône rotary powered version. The 10-cylinder engine components are not completely bleed-free from some lateral viewing angles, as cylinders are quite close together, but from more forward or rearward angles they seem to display quite well. Then, the semi-circular 2D exhaust half-rings are rather simple, as parts count is very high (at 149.6%), but look OK from most angles, I´d say. The SCASM code to call the different elements to make the two Virtual Cockpit views display correctly was quite complicated, involving orderly calling of wing-struts, engine struts, engine nacelles, cockpit struts, dashboard, a cockpit section, a cockpit-floor section, the pilot´s head, and the wind-screen, but came out working very well! Here are a few more screenshots, including a shot of each of the two SCASMed virtual cockpit views. ...I know some of you like eye-candy! From the gunner´s position, looking backwards you can see the pilot squinting out of his cockpit trough the lower wind-shield, perhaps ducking. Now it´s the turn of the predecessor of the G.4 bomber, namely the single-engined, two-seater Caudron G.3 observer/trainer. It has certain historical importance, and at the time seemed to be fit for the adventurous! When WWI broke out, the Caudron brothers supplied the French Air Ministry with the G.3, that was used at the beginning, during the battle of the Marne in 1914. It was built in large series, also by other companies, without the Caudron Brothers requiring any rights, thus showing their patriotism. In total, over 2800 units were built. The aircraft was solid, reliable, manoueverable and easy to fly, capable of loopings and barrel rolls, and was exported to many other countries like Great Britain, Belgium, Russia, Venezuela and the U.S., as well as the Middle East. Even after the war it was flown in Aero Clubs all over the world. Impressive feats were achieved with this plane - In 1919, Jules Védrines landed on the Galleries Lafayette's roof, right in the heart of Paris. At that time it was also fashionable to fly under bridges in this plane. Adrienne Bolland crossed the Andes from Argentina to Chile in 1921, reaching an altitude of 13,000ft. Francois Durafour landed on the west slope of Mont Blanc and took off again. Anyway, I´m just doing up the model with the CFS1 improvements I managed to put into the Caudron G.4. The Caudron G.3 had 1 cowled 9-cylinder, Le Rhône rotary engine rated at 80 Hp with max. 92 Hp, (also Gnome or Clerguet on some models), with a top speed of 67 mph, or alternatively, 1 uncowled 10-cylinder Anzani radial, rated at 100 hp ,with max. 110 Hp, and a top speed of 69 mph. Here are some screenshots. It´s easy to see similarities in the design, from which the G.4 was developed a little later. I´ll be uploading the two G.3 models as soon as I´ve ironed out a few pending minor issues. one in British colours, and the Le Rhône one in Franch colours. If someone were to have a different idea or wish, do let me know and I´ll proceed accordingly. For now, here are some screenshots of the liveries. I hope you enjoy the biplanes! Last edited by aleatorylamp; January 8th, 2019 at 05:13.
of the Caudron G.3 equipped with floats, of which 3 units were built for the French Marine. One was carried aboard the cruise ship Foudre. It looks really great! Top speed was 59 mph, a little less than the land-version, given the added drag of the floats. It had an 80 Hp (max 92 Hp) rotary engine. The first one shows the model on the water with bottom part of the floats underwater. Lift-off is at about 45 mph, and then the submerged section of the floats and the wheels appear. all water textures are converted into concrete or something that won´t crash the floatplane. I still have to change the cockpit area between the crew members - the division was much less pronounced. has a totally different layout of the lattice-fuselage, wing struts, and central nacelle shape. The bottom wing was also larger, and had the same width as the top one. Last edited by aleatorylamp; January 12th, 2019 at 15:28. After adjusting and modifying several aspects of the G.3, the Seaplane version is now ready. As you will see from the attached screenshots, there are numerous differences. illustrate it, and it has gone very well. land it on the duck-pond, get out and buy an ice-cream at the kiosk! land version of the model as well. Last edited by aleatorylamp; January 14th, 2019 at 06:40. ...and to complete the upload, the necessary land version of the amphibian is also ready. were submerged in the water.